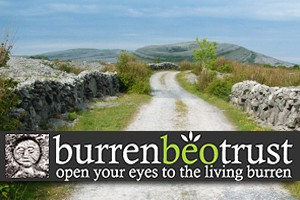 The Burren in County Clare is home to 1,100 species of plants out of the 1,400 in Ireland as a whole. It is the only place in Europe where Mediterranean and Arctic Alpine plants grow together in perfect harmony. Rare flowers include Lady’s Tresses (Spiranthes spiralis), Bee Orchids (Ophrys apifera), Fly Orchids (Ophrys muscifera), Irish Orchids (Neotinia maculate), Pyramidal Orchids (Anacamptis pyramidalis), Lesser Butterfly Orchids (Platanthera bifolia) and Fragrant Orchids (Gymnadenia conopsia). In terms of fauna, feral goats, foxes and hares are the most common mammals encountered when walking in the Burren. A number of more rare and elusive species such as the carnivorous pine martin, the snake-like slow worm, and the rare lesser horseshoe bat are also found there, as well as over 100 breeding birds and almost all of Ireland’s native butterfly species. 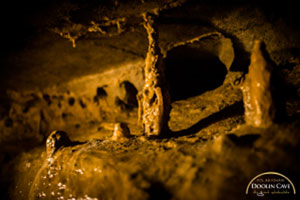 That so many fascinating species are found at the Burren is due to a happy coincidence of natural and cultural factors. As well as the unique growing environment provided by the thick limestone and thins soil, low impact traditional farming practices such as the ancient practice of winter grazing contribute to the presence of this rich flora. Most of the Burren has been designated as a Special Area of Conservation, a title reserved for the very best natural environments in Europe. Visitors should treat this special place with the respect that it deserves and needs, don’t pick or trample flowers, don’t disturb the wildlife and enjoy their visit. Sail to the Aran Islands and the Cliffs of Moher from Doolin pier. Doolin2Aran Ferries, sail daily to each of the Aran Islands from Doolin. With Doolin2Aran Ferries customers can visit the spectacular Dún Aengus fort on Inis Mór, get away from it all on Inis Meáin, or take a quick thirty minute crossing to the smallest one, the beautiful island of Inis Oírr. 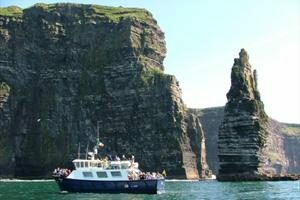 There are also cruises to see the scale and majestic beauty of the Cliffs of Moher on their one hour cruise or the option to visit Inis Oírr and the Cliffs of Moher in the same day. The boats leave Doolin pier in County Clare daily. Doolin2Aran Ferries have two custom built boats that carry up to 70 passengers each.